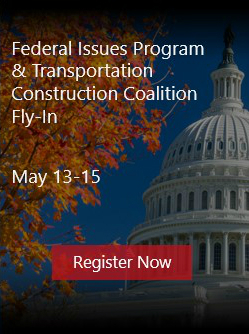 Home/2019 Press Releases, ARTBA News/Safety, Transportation Project Management & Legal Issues at Forefront of Professional Development Week June 4-6 in D.C.
(WASHINGTON)— Safety training, project management fundamentals, and legal and regulatory “hot topics” form the core of a new professional development program for transportation design and construction professionals hosted June 4-6 by the American Road & Transportation Builders Association’s Foundation. As part of “Transportation Construction Professional Development Week,” industry executives can participate in one or both events at ARTBA’s D.C. offices: Safety Training, Certification Preparation & Project Management Academy, and the 11th Annual Law & Regulatory Forum. The programs are intended for project managers, supervisors and foremen, safety professionals, in-house legal counsel or staff attorneys, compliance officers, and other senior executives. The safety session focuses on identifying and addressing the top five hazards—struck-by, falls, trenching, night work and temporary traffic control—in roadway construction sites. It’s also a primer for the ANSI-accredited Safety Certification for Transportation Project ProfessionalsTM program and will include a practice exam and explanation of the correct answers. The Project Management Academy covers: construction documentation, client relations, ethics and compliance programs. And the legal forum features presentations from top industry lawyers and industry leaders on such topics as compliance, design risk, liquidated damages, risk management and public-private partnerships. Professional Development Hours (PDHs) are available. Check out the full program. Established in 1985, the ARTBA Foundation is a 501(c) 3 tax-exempt entity designed to “promote research, education and public awareness” about the impacts of transportation investment. The Foundation supports an array of initiatives, including educational scholarships, awards, professional development academies, a transportation project safety certification program, roadway work zone safety and training, special economic reports and an exhibition on transportation at the Smithsonian National Museum of American History. By Eileen Houlihan|2019-03-22T09:37:24+00:00March 22nd, 2019|2019 Press Releases, ARTBA News|Comments Off on Safety, Transportation Project Management & Legal Issues at Forefront of Professional Development Week June 4-6 in D.C.